I just came back from Bidadi India, where I witnessed remarkable events that involved haritaki. I was filming a documentary on transformation, and the transformation was being orchestrated by the Indian Avatar, Paramahamsa Nithyananda. Paramahamsa Nithyananda is using haritaki in many many different ways. He explains that when he uses haritaki with other herbs and his energy he can create alchemical mixtures that create rapid increases in consciousness. The program became quite bizarre when Nithyanananda mixed these herbal mixtures, using haritaki, turmeric,neem and many other herbs. These herbs are then added to butter and oils to and heated over fire for many hours to make special pastes. These pastes and potions are then applied to the body. In some cases the pastes are applied to specific areas of the body to work in increasing a specific brain function, such as memory or third eye powers. At other times the aushadha is applied over the whole body and may be left there for some hours before washing off. In the videos below you will see that the haritaki and aushadha and initiation is causing quite remarkable events to take place, including moving of objects with the mind, this is referred to as consciousness over matter. In this discourse delivered on 30 August 2017, Paramahamsa Nithyananda reveals deeper truths about the Spiritual Alchemy science called ‘Aushada’. Aushada is one of the 3 methods through which Sadāshiva opens up the possibilities of manifesting all the powers, manifesting all the states of Consciousness and exploring dimensions of the Universe. Aushada can be herbal combinations; combination of herbs Prana, cosmic force energies, ultimately the Shaktipada of Sadashiva. Watch, share and like the video’s and Subscribe to our channel to be notified of the next upload. My wife Maria Perez, in this video explains how the haritaki, aushadha and the initiation of Paramahamsa Nithyananda helps her move a bottle. If the gut can weaken the brain, it is also likely to strengthen the brain. This is where the clairvoyant observations of Paramahamsa Nithyananda come in. He says that he sees the effects of Haritaki on the brain. He witnesses the brain becoming clearer as the grooves of negativity in the brain are removed by the Haritaki. He says that the test is to take an IQ test one day before you begin to take haritaki, then take haritaki in the evening before bed, and take the IQ test the morning of the second day.He says that you will see an increase in results between the two tests. 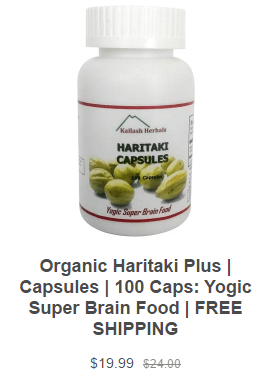 How does Haritaki work on the Brain? Haritaki contains antibacterial agents that clean the gut of harmful bacteria. Researchers point out that for every hour the human waste stays in the gut the bacteria multiply by many millions. Many of these bacteria are harmful and have been connected with diseases such as Parkinson’s and Alzheimer’s diseases. Researchers have found that the bacteria penetrate the intestinal walls, and create cuts. These cuts are similar to the lesions that appear in the brain as part of the onset of these diseases. Very interestingly, these cuts in the intestinal walls are showing up up to 20 years in advance of the cuts appearing in the brain. The conclusion is that the disease spreads through the central nervous system to the brain. Tests for early onset of Parkinson’s are now being conducted by looking into the intestines for signs of these cuts. The gut–brain axis is the biochemical signaling that takes place between the gastrointestinal tract and the central nervous system. That term has been expanded to include the role of the gut flora in the interplay; the term “microbiome-gut-brain axis” is sometimes used to describe paradigms explicitly including the gut flora. 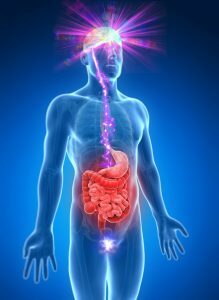 Broadly defined, the gut-brain axis includes the central nervous system, neuroendocrine and neuroimmune systems including the hypothalamic–pituitary–adrenal axis (HPA axis), sympathetic and parasympathetic arms of the autonomic nervous system including the enteric nervous system, the vagus nerve, and the gut microbiota. Interest in the field was sparked by a 2004 study showing that germ-free mice showed an exaggerated HPA axis response to stress compared to non-GF laboratory mice. As of January 2016, most of the work that has been done on the role of gut flora in the gut-brain axis had been conducted in animals, or characterizing the various neuroactive compounds that gut flora can produce, and studies with humans measuring differences between people with various psychiatric and neurological differences, or changes to gut flora in response to stress, or measuring effects of various probiotics (dubbed “psychobiotics in this context), had generally been small and could not be generalized; whether changes to gut flora are a result of disease, a cause of disease, or both in any number of possible feedback loops in the gut-brain axis, remained unclear. A systematic review from 2016 examined the preclinical and small human trials that have been conducted with certain commercially available strains of probiotic bacteria and found that among those tested, Bifidobacterium and Lactobacillusgenera (B. longum, B. breve, B. infantis, L. helveticus, L. rhamnosus, L. plantarum, and L. casei), had the most potential to be useful for certain central nervous system disorders. “Our study shows that patients who have had the the entire vagus nerve severed were protected against Parkinson’s disease. Their risk was halved after 20 years. However, patients who had only had a small part of the vagus nerve severed where not protected. This also fits the hypothesis that the disease process is strongly dependent on a fully or partially intact vagus nerve to be able to reach and affect the brain,” she says. Haritaki has been shown to help in the de-calcification of the pineal gland by removing mercury from the body. There are many toxins that contribute to calcification of the pineal gland, and these include pesticides, fluoride, mercury, tap water, calcium, sugar, artificial sweeteners, caffeine, tobacco and alcohol. We obviously want to stay away from this list as soon as possible to reduce the continuance of calcium build up. To remove the calcium buildup that we already have so that the pineal gland is decalcified we can use Haritaki as one tool. The research on how to use Haritaki to remove the mercury is at this link here. this research was conducted by the well known doctor, Dr. Mercola. he came up with a few different protocols that are all listed in the link above. To use Haritaki to decalcify the pineal gland plan on taking the Haritaki in either the powder form or capsule form. Plan on taking large doses of the Haritaki, in the order of a teaspoon per day in the evening before bed and after food. You can also take the Haritaki in capsule form, plan on taking 3-6 capsules. As noted above, calcification tends to become more severe with age, with many people experiencing symptoms of heavy calcification of the pineal gland by the time they are 17. This means that an MRI or other scan would show a large lump of calcium phosphate on the gland as well as other parts of the body. This calcification process is caused by constant exposure to substances like fluoride which build up in the body over time. Toothpaste, public water systems, hormones, food additives, excess sugar and sweeteners in your diet or even regular exposure to cell phones has been linked to the phenomenon of calcifying the pineal gland.